It seems a bit intuitive that a flagstone patio might not be that difficult to build provided that you have the platform to build the flagstone patio on. Granted the patio you see in the photo directly below is one that is professionally built but let’s look at the basics of building a flagstone patio. Some aspects of building the patio are a little more involved and might surprise you. What I’d like to do is provide a checklist for you of the questions to ask and things to look for when evaluating builders or masons to build your flagstone patio and also some of the design questions to think about when deciding exactly what you want. What shape patio do you want? Do you want a decorative or plain facade? Do you need any lighting or electrical installed or run through the patio? Before you have your builder or contractor come out, you will want to think about the shape of patio you would like. Do you want square or rectangular or curvilinear? Curves are hot right now and as you can see above they take your patio design to a completely new level. Also consider if you want a plain or decorative facade or side of the foundation that supports your patio. 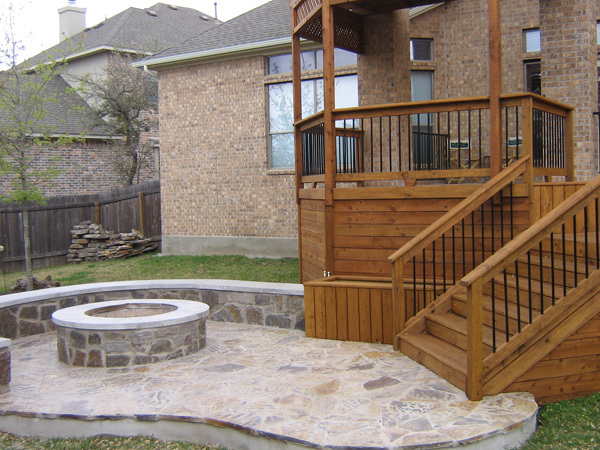 A lot of your decision will depend on the height of the patio foundation but also on the final aesthetics you desire. This small detail adds to the cost but ask your builder about options on creating a decorative facade to finish off your patio. Also consider whether you want electrical installed or run through your patio. If your patio is the only thing that separates your house or deck from your pool, you may need electrical run under or through. Again, ask your builder to help you with these considerations in the building process. What foundation or patio platform do you have or should you build for your new flagstone patio? Will you need your irrigation company to come out prior to building? Will the builder attach the patio foundation to your house foundation? What material will be used under the mortar and flagstones? Is the builder planning on using expansion joints? How wide will the mortar joints be? How will your flagstone patio be sealed? How long should your patio last? Let’s look at some of these questions so you have a checklist of what to look for when choosing a company to build your patio. Your flagstone patio will need a strong, sturdy, solid and level base for the flagstones. Do you have an existing concrete structure to build the patio on? If so, is it level? If not, make sure the patio builder will be building a concrete foundation that’s suitable for your patio. Will you need your irrigation company to come out prior to building? If you have have sprinkler heads in the area where your new patio will go, you have two options. You can have your irrigation company come out to move or remove the heads. Alternately, your patio builder should be able to cap the sprinkler heads for you. 3. Will the builder attach the patio foundation to your house foundation? With most patios, the patio will be abut to your house. When building a foundation for your patio, the builder has 2 choices. They can build the patio foundation to but up against your home’s foundation. Or, the better builders will actually attach the patio foundation to the home’s foundation. At Archadeck, we connect to house foundation slab using rebar every 2 feet. Then we create a 1 ft by 1 ft perimeter footing also strengthened with rebar. It’s really a critical step to ensuring the strength and longevity of your patios. A lot of other companies just simply don’t do any reinforcement to the patio foundation. 4. What material will be used under the mortar and flagstones? You want to make sure there is some sort of strengthening material across the top of the concrete base where your flagstone will be laid. We use wire mesh to ensure the surface is prepped and ready for the flagstone and mortar. 5. Is the builder planning on using expansion joints? This is a really important one depending on the size of your patio. Regardless of what we do, over time, many concrete structures will crack due to the movement of the earth below the concrete. So, a good builder will plan for this and “build in” a system to keep the flagstone in tact. We use something called expansion joints. Every 10-12 feet, depending on width of the patio we create control joints which are man-made joints. These joints are essentially man-made cracks in the foundation that are not visible on the top of the patio and here’s why. As I said above, we use a wire mesh to support the flagstone top patio layer that sits above the concrete patio foundation. These very small man-made joints give the concrete foundation room to expand and contract. 6. How wide will the mortar joints be? One thing that’s very important is to find out how tight the mortar joints will be. You’ve probably seen patios that have a little bit of flagstone and a lot of mortar. That design makes the patio significantly less expensive for the mason but significantly lower quality and aesthetics for you. You want to make sure the builder will use a very tight mosaic pattern so you see mostly flagstone on the top of the patio because your are paying for stone, not mortar. 7. 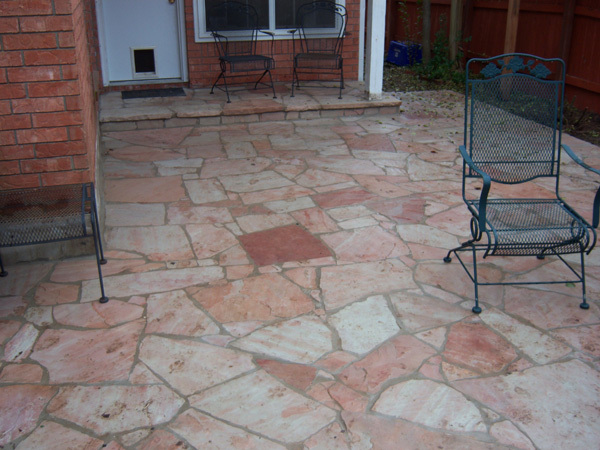 How will your flagstone patio be sealed? You want to make sure to use a sealer on the top of your flagstone patio after all the mortar has cured. It’s a small but important step. The sealer will be undetectable but keeps moisture from penetrating the stone and keeps mold and mildew out. It also gives your patio a cleaner look. These days, builders and contractors are reluctant to want to come back out for a small step that doesn’t take much time. But that hour or two that they spend sealing your deck could add years to your deck. 8. How long should your patio last? If done right, you should expect your patio to be maintenance free for about 5-10 years. This entry was posted on September 26, 2010 by austinporchandpatio. 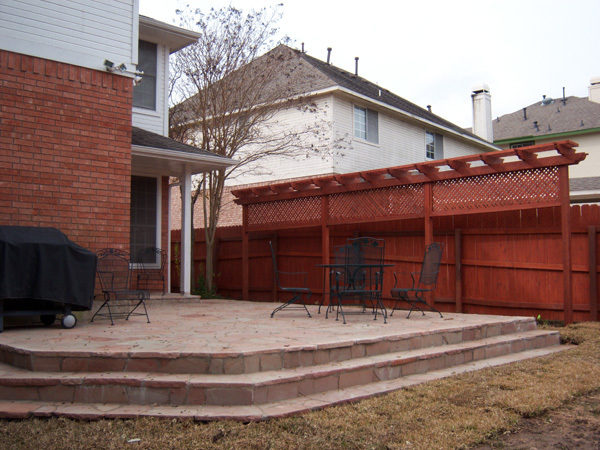 It was filed under Flagstone, Flagstone Patios, Patios and was tagged with pergola privacy wall.